Gr. 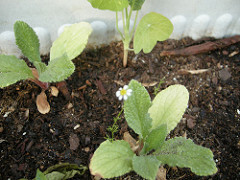 khamaimelon (earth apple), L. Matricaria chamomilla, or Anthemis nobilis compositae, Eng. chamomile. It is any of several plants of the aster family, with scented leaves and small daisy-like flowers. It has been a widely cultivated herb since ancient times. In cookery, one dish adapted by the Spaniards from Persian cookery was sikbaj, the marinade (Cast escabeche), or a mild dish that lacked acidity due to chamomile. It was thought that it had the power to bring sickly plants back to health if chamomile was set next to it. The dried leaves and flowers were used in herbal cures. Boorde recommends rubbing the body with oil of chamomile to cure palsy. The flowers give off scent similar to ripe apples. The Spanish name literally means "apples of the earth". As it is not demanding about the climate, it spreads like a weed. It was one of the nine sacred herbs of the Anglo-Saxons. In the Middle Ages, it came to signify money, sleep, love, and purification. Growing in the southern part of England, it was commonly used as a strewing-herb. To improve blonde hair, it was used as a rinse to give blonde highlights and leave hair perfumed. It was popular in English weddings and used as snuff to cure drowsiness. 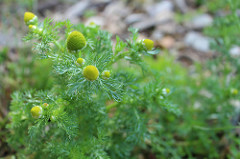 chamomile (buds), Sp. manzanilla (flor). An infusion of this flower was commonly used for the stomach, to stop spasms and to reduce fever. It is harvested in May-June. The heads are cut from stalk and dried. Then they are stored in sealed containers, away from direct light. Medicinally, they were used against wide range of illnesses, including menstrual disorders (re matrix, uterus). 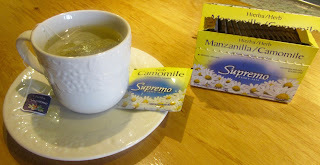 In the Middle Ages chamomile buds boiled in water were used as sedatives, antihelminthic, and antipastics. Warmed bags of them soothed earaches and facial swellings. Mixed in soap formulas and bath salts were thought to strengthen the healthy and ease the pains of the sick, and in shampoos for blonde highlights to hair. Spanish women used them daily when combing their hair. chamomile oil, see aceite de manzanilla.